This is hands-down the best recipe for gluten free and vegan pancakes, EVER. 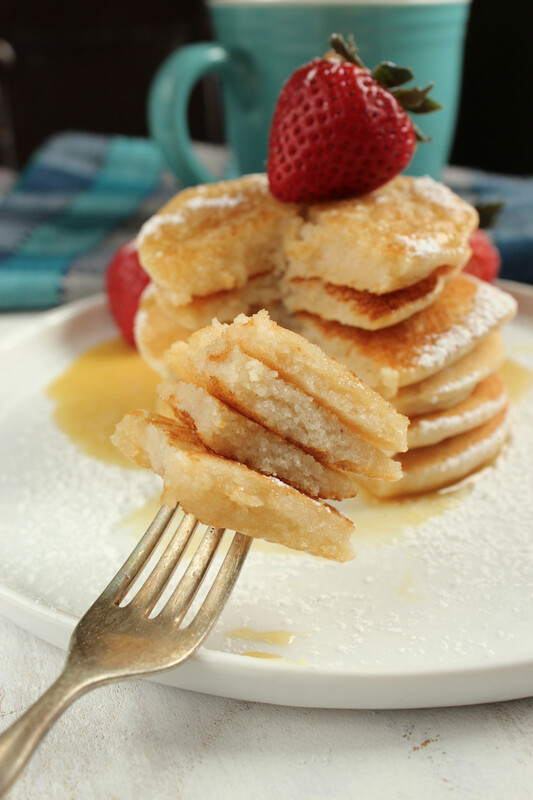 These pancakes are fluffy and light, but still perfectly moist, and so easy to make! Everyone likes their pancakes a little bit different. It’s one of those things, like bloody marys or pizza or oatmeal, that breeds very specific preferences in people. 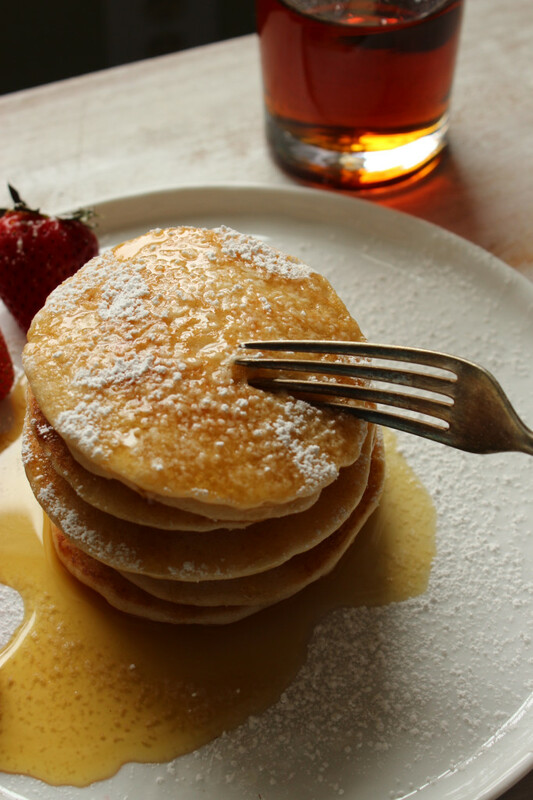 Pancakes can be fluffy or dense. They can be crispy or cakey. They can be plain or filled with blueberries or bananas or chocolate chips. They can be silver dollar or dinner plate sized. 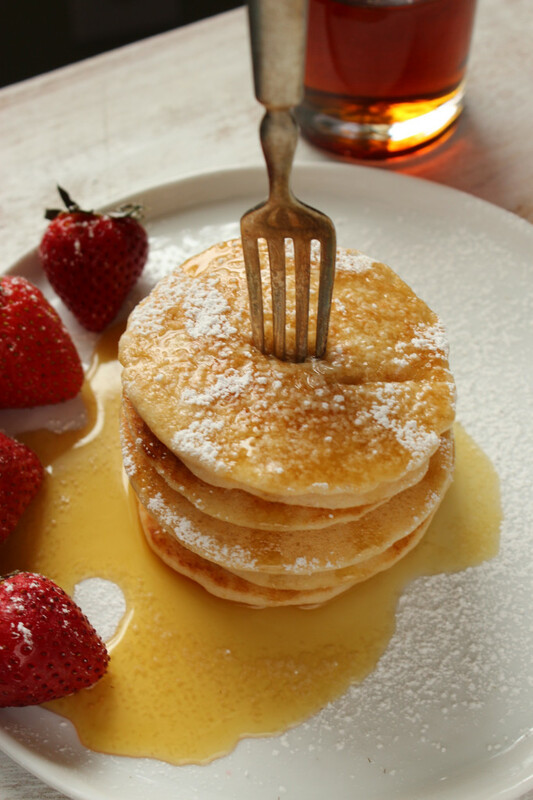 But if you ask me, I think there’s something to be said for simple, straight-up, delicious pancakes. 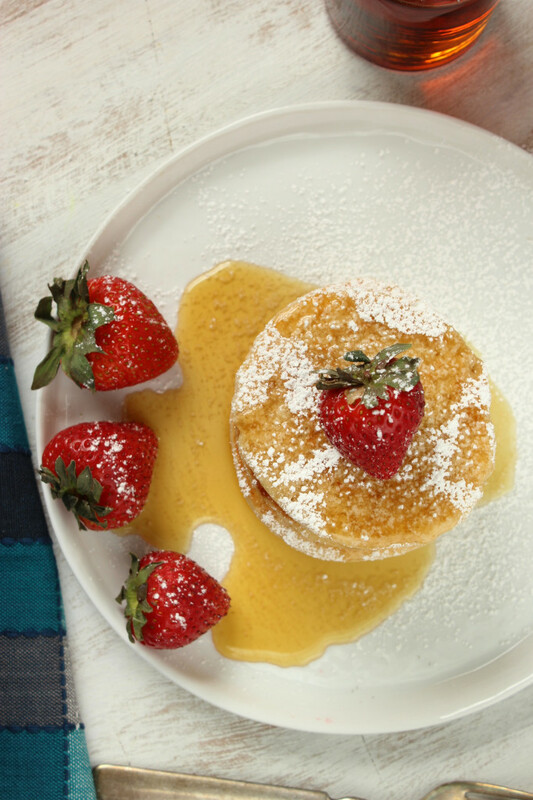 Just so you know what these pancakes are all about: they’re light and fluffy, flavored with warm vanilla and a hint of coconut. They’re easy to make, requiring only 2 bowls and a few measuring cups. Just like my favorite waffle recipe from which these pancakes were born, these are, in my opinion, the most perfect gluten-free pancakes ever made. 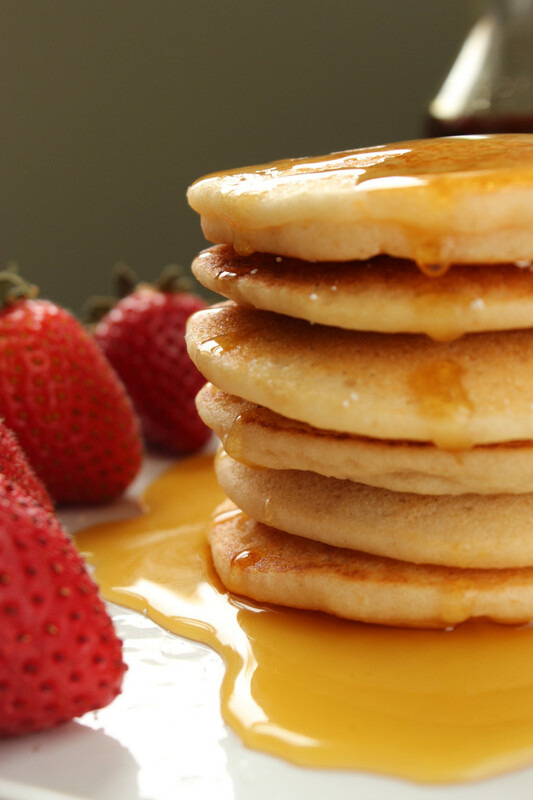 No matter what your preference may be, most people would agree to the fact that in general, pancakes freakin’ rock. 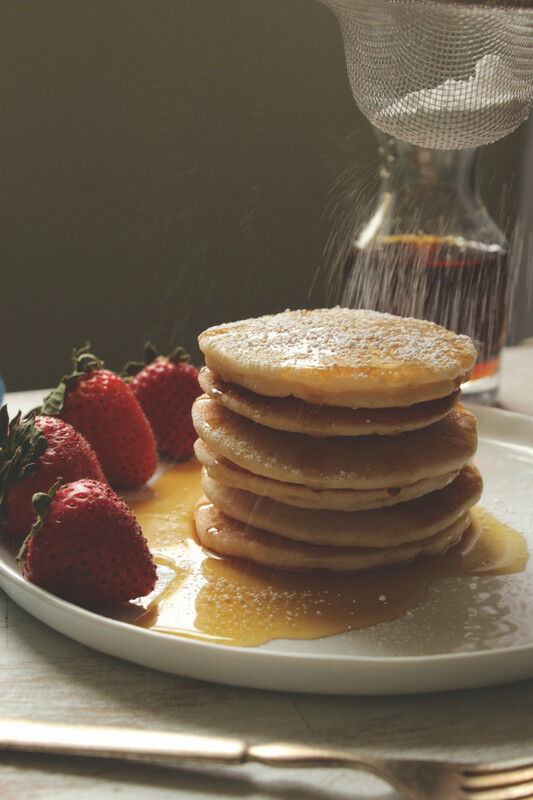 Before school, for brinner [that’s breakfast at dinner], after a night of too much revelry, or at brunch, they have a magical way of hitting the spot and filling it so very full that you want to crawl right back into bed. 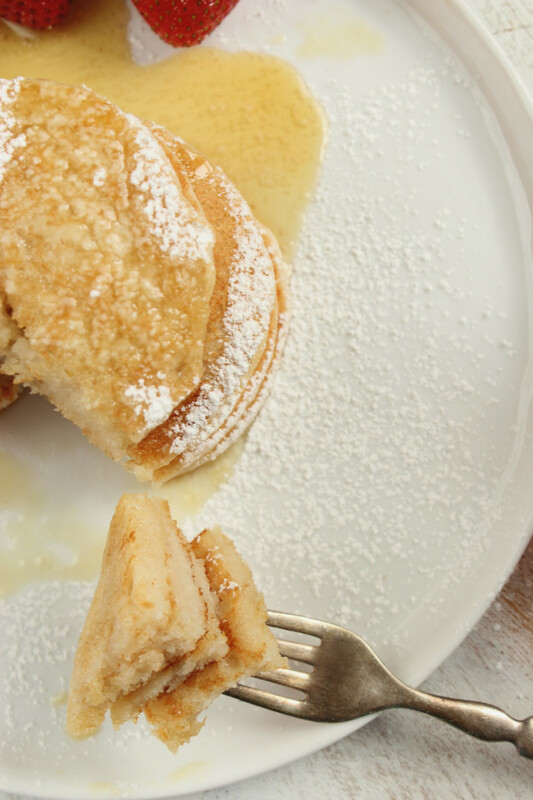 When it comes to eating pancakes, is it possible to ever, really know when to quit? For me, at least, I always end up hopelessly gorged. Like, roll me out of the kitchen or restaurant gorged. If there are pancakes in my face [or most any breakfast food, for that matter], I just don’t know when to stop. In my experience, the key to cooking a proper pancake is to get the skillet or griddle good and hot. Give it a quick spritz of olive oil spray and scoop about 1/4 cup of batter onto the surface. You want to hear a good sizzle — that means the edges will be golden and crispy. 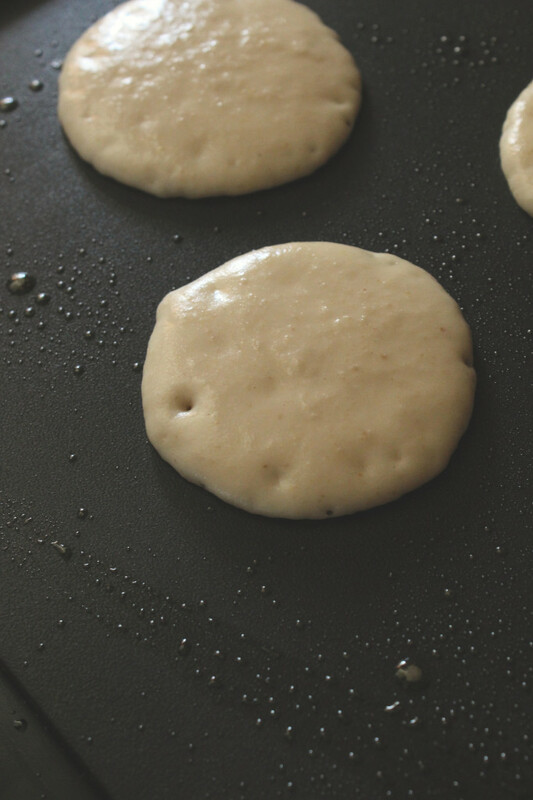 Let each pancake cook until several bubbles start to surface in the batter. Give them a quick flip and cook for about 4 more minutes on the opposite side. Cook them up for yourself, for the family, or for your friends. I’m partial to traditional syrup, but I won’t judge you for topping them with peanut butter, jam, honey, or sriracha for that matter. 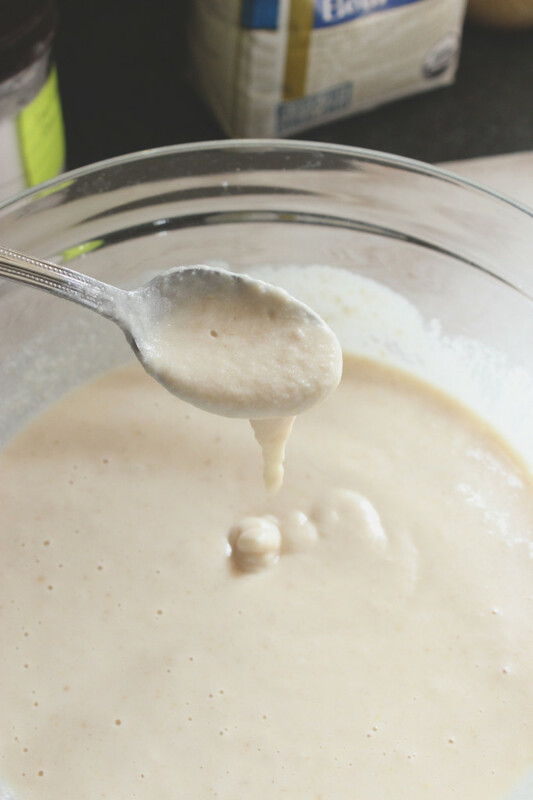 This batter will keep in the refrigerator for a week or more, but it’s likely to harden when cooled as a result of the coconut oil. Just allow it to reach room temperature, add more coconut milk and mix it up until it’s liquid again. 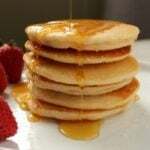 I love this GF Vegan Pancakes recipe. I would love to feature it in our website, Greenthickies. I will not be posting the actual recipe, but will only use one image from the post and a small quote and link directly back to the original post in your site. Thanks so much for reaching out! You’re more than welcome to share this recipe. :) Can’t wait to see the feature! Thank You for this recipe. It works and is delicious. I halved the recipe, used a mix of coconut and almond milk and reduced the sugar. I also added more liquid and got a lighter pancake. 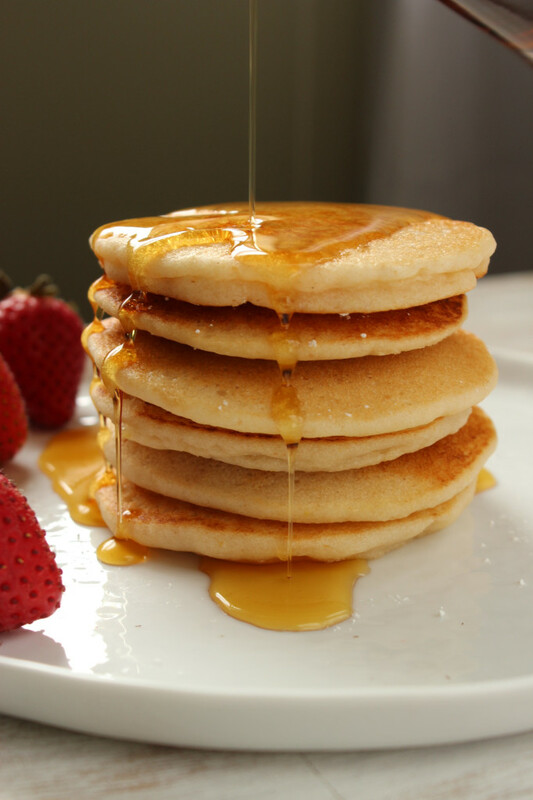 Best pancakes. Is coconut flour a must for this recipe? I personally don’t like the taste of coconut in general so i don’t have any coconut flour on hand. So could i just a dd an extra 1/2 cup of rice flour or tapioca flour or will that mess up the recipe? If so, is there another light gluten-free flour alternative to coconut flour? You could certainly try to use more rice flour instead of coconut flour. I wouldn’t recommend tapioca as they will probably turn out too chewy/gummy. I’ve also heard that almond flour works in some circumstances as a substitute for coconut flour… but I haven’t tried it. Hopefully they turn out ok for you! I followed the recipe exactly and they came out gooey not fluffy like in your picture – can you give me some tips. I’m not sure what could’ve gone wrong. We make these quite often and I’ve never had them turn out gooey. Did you use coconut milk from the carton? I tried this recipe using Coconut Milk, which comes in a can in the canned food section. It didn’t come out. Looking back I realize you probably mean “Coconut Non-dairy Beverage”, which is in the supermarket next to the soy milk, which is decidedly not Coconut Milk. You should make the distinction clear in the recipe. I will try it out with the correct type of milk next. Hi William! I’m sorry that the recipe didn’t work out for you – the milk confusion was definitely the issue. In the ingredients, I specify that I use SoDelicious’ regular variety, which is a non-dairy beverage – correct. I hope it works out for you next time! This is the third pancake recipe we’ve tried since my sweetie is gluten free, & the first now eggs are a no-no. She doesn’t like fluffy pancakes, so I used baking soda instead of baking powder. They’re still great! 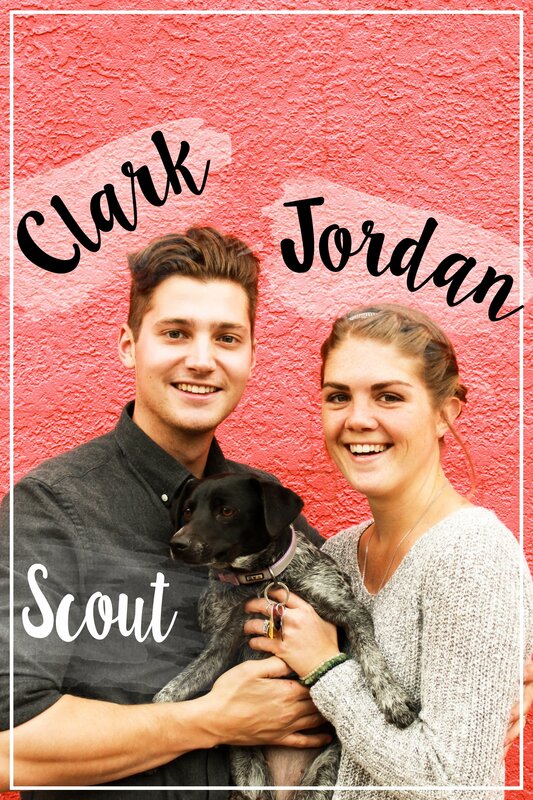 We have a new family favorite ! Thank you so much for sharing! I loved your story & step by step pictures was a great touch! Thanks for letting me know what you thought of the pancakes! These are a hit amongst vegans and non-vegans alike. So glad you, and your family loved it! This is the first time I made these pancakes. I substituted sorghum for brown rice flour. They turned out fantastic and btw my first successful pancakes since being gluten free. My husband even liked them. Thanks, I’ll definitely make again. I’ve made these twice now. They have a lovely texture and flavor. The only thing is that it required quite a bit more liquid, like 3/4 a cup full! But they are GREAT! *** This last time I subbed out 1/8 of a cup of white rice flour for vanilla flavored rice protein powder for an added nutritional boost….still DELICIOUS! Thanks so much for your notes! It’s good to know you can sub protein in place of flour. I never thought of trying that! These pancakes were a success at my house (and I’m the only vegan here). They were so easy to prepare! I din’t have coconut milk so I used almond milk. They were fluffy and soft just like regular pancakes. I am so happy I found this recipe, thanks for posting it!